Perkins Bass with Charles after his son was elected to his former seat in the US House. Mr. Bass’s father was a governor. CONCORD, N.H. - Former US representative Perkins Bass, the son of a New Hampshire governor and father of a current congressman, has died. At 99, he was believed to have been the oldest former member of the US House of Representatives. Mr. Bass died peacefully of old age Tuesday at his home in Peterborough, said his son, US Representative Charles Bass, Republican of New Hampshire. Until recently, the two took short walks and enjoyed discussing current events, he said. 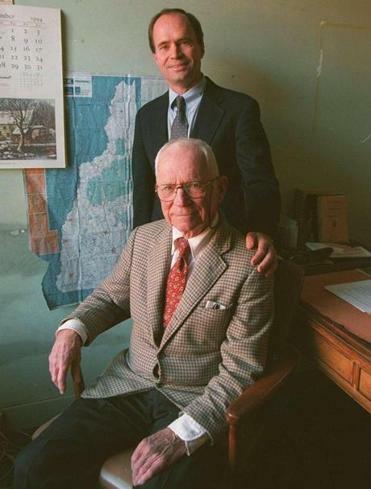 Although Perkins Bass was a Republican, he did not let party ideology narrow his views, his son said. “He felt that the ability of one individual to tolerate the views of another was as important as one’s own views and that it was important to be, first, a good public servant, but, secondly, to be tolerant of people that had different views from your own and learn and listen, because better things came about as a result of that,’’ Charles Bass said. Perkins Bass was born in East Walpole, Mass. He joined the military after graduating from Dartmouth College and Harvard Law School and served as a member of the Flying Tigers, US airmen who defended Chinese supply routes over the Himalayas during World War II, earning a Bronze Star. Mr. Bass, whose father, Robert Bass, was governor of New Hampshire from 1911 to 1913, served in the New Hampshire House for four terms and as president of the New Hampshire Senate for one term before running for Congress. He represented New Hampshire’s Second Congressional District from 1954-1963 and ran unsuccessfully for the US Senate in 1962. After he returned to New Hampshire, he served as a town selectman in Peterborough. Charles Bass, who served six terms in Congress before losing in 2006 and then winning back the seat last year, said that while it meant a great deal to him to have his father’s help during all his campaigns, he was more grateful for his support during his defeats. “He was there to basically say: ‘I’ve been through it; I know what it’s like. There are very few of us who have done this, and I’m here to continue to be your father and your friend,’ ’’ Charles Bass said. State and federal officials remembered Mr. Bass as a devoted public servant. US Senator Kelly Ayotte, Republican of New Hampshire, said Mr. Bass “personified the very best of public service’’ and was known for extending a warm welcome to constituents visiting Washington. “His commitment to civility and decency in public life stands as a lasting model,’’ she said. Governor John Lynch, a Democrat, remembered Mr. Bass as a proud family man and a New Hampshire resident. “Perkins Bass loved New Hampshire and its people, but, above all, he cherished time spent with his family in his hometown of Peterborough,’’ Lynch said. Charles Bass’s office said that Perkins Bass had been the oldest living former member of the US House. The House clerk’s historian’s office referred questions to the US Association of Former Members of Congress, whose 550 members make up about two-thirds of the living former congressmen and congresswomen. Because the group is not in touch with all former members of Congress, a spokeswoman said she could not confirm the report, but said 97-year-old Ken Hechler, a Democrat from West Virginia, is the association’s oldest member. Mr. Bass was a founding partner in the Manchester law firm Sheehan, Phinney, Bass, and Green and practiced there until his election to Congress. He leaves his second wife, Rosaly; five children; two stepchildren; and many grandchildren and great-grandchildren. A memorial celebration is planned for Nov. 19 at the Monadnock Country Club.